When Shawn Fisher emailed me that the US Army was looking at adopting a new medium machinegun, this one capable of accurate automatic fire at a range of over a mile, where the M-2 in .50BMG can only deliver single shots, I was intrigued. When I heard it was being considered in .338 Norma Magnum, I knew it was time for a reloading press. The Reloading Press is an approximately fortnightly (every other week) feature here on Gaming Ballistic that started in 2016. Each article looks at some interesting real-world cartridges and presents them with hopefully-useful information in GURPS format. Except when it’s interrupted by massive writing projects, something interesting should appear every couple of weeks. The 6x35mm KAC seems to be another reaction to the desire to give folks a short, handy shoulder arm that hits harder than a pistol against what I’ll call “firm” targets. They’re not “soft” targets (unarmored folks in light clothing), nor are they armored behind real cover or wearing Class III or IV level protection. They’ve got soft body armor or clothing thick enough to pose an issue against handguns, or are behind fragile but hard window glass that provides a measure of barrier protection, if a permeable kind. There’s a lot of information about this round that seems to be classified. It was designed, seemingly, because when you take a round designed to perform well out of a 500mm barrel (the 5.56x45mm) and then chop said barrel down to 200mm, surprise-surprise you get issues. Low muzzle velocity and a fireball and concussion that likely rivals Thor getting frisky with Mjolnir. There’s an interesting problem – or at least an observation – when looking at the near-future slugthrowers from GURPS Ultra-Tech. The weapons themselves are a mixed bag of “well, it must be better!” and “there’s hardly any way that can happen.” It’s understandable, but leaving that aside, a futuristic pistol is a problem no matter how you slice it. Why? The presumption of evolving threats, and a natural asymptote in the evolution of a design that debuted, fundamentally, in around 1900. The broom-handle Mauser C96, the M1900 Browning, and of course the M1911 Colt .45 ACP are all basically TL6 designs that evolved through two tech levels (in GURPS terms) to arrive at the early 21st century darn near as improved as they’re going to get. One of the things one has to realize about a pistol is that they’ve always been secondary weapons. They were a one-shot (or even six-shot, in the US Civil War) first-strike to be wielded along side a saber, the primary weapon, initially. Then they were an officer’s weapon or signature, carried by commanders partially in order to remind them that their role was to direct troops, not engage in personal heroics. Side note: I’m not necessarily making that up. I knew, personally, a Navy SEAL commander who was in Viet Nam. He was the course leader for the McKinsey and Company “mini-MBA,” and a great guy. He was quirky – he went swimming five times a day – but he told great stories, and his charisma and leadership were palpable. Naturally, I engaged him in conversation, and he told me that he rarely (maybe not ever) carried a weapon larger than a pistol, for that exact reason. His troops were there to kill the enemy; he was there to direct his troops. Staring over a gunsight robbed him of strategic vision. Hrm, says I. But the thing about a pistol is that it’s not a primary weapon. As the old joke goes, “if I were expecting trouble, I’d have brought my rifle.” It’s a defensive or backup weapon that you can have with you all the time. While there’s no question a pistol can seriously kill you, it’s not a “serious” weapon for offensive purposes in nearly any case . So we need to define what the mission of the weapon is. And I’m going to be pretty restrictive about it. Note how I don’t say “it should penetrate body armor.” Punching through armor is an offensive task. If you really want to stretch it, you can say that it should potentially be able to incapacitate someone through light armor, and by light we’re probably talking about car doors or casual protection – probably no more than DR 8, maybe even as low as DR 4. If the threat is wearing more than that, you need a rifle. What does “incapacitate” mean? Heck, it probably means a single vitals hit will make you start rolling for unconsciousness. That’s an average penetrating damage of about 1d+1 pi. Asking a “casual” hit to the torso to do that will put the requirement of base damage in the 3d to 3d+2 range . . . which is 10.5 to 12.5 points of damage. With a pi+ bullet, that’s 2d or 2d+1. GURPS Ultra-Tech is a nifty book full of some fine inspiration. It is, however, a victim of being one of the first Tech books out there from fourth edition, and one that tried to be a few things at once, possibly while it was being written, possibly during playtest, and certainly during the post-playtest rewrites that occurred. The projectile weapons are . . . in need of some work. There are some notable issues for the weapons, and honestly what they’re in need of is a redesign, rather than a rationalization. So, without further ado, here are some thoughts. The Reloading Press is an at-least-weekly feature here on Gaming Ballistic for 2016. Each week it looks at some interesting real-world cartridges and presents them with hopefully-useful information in GURPS Format. Except when it’s interrupted by a massive writing project, then it’s not every week. But by special request, here’s the first of several revolver cartridges, which have been sadly neglected on The Reloading Press to date. 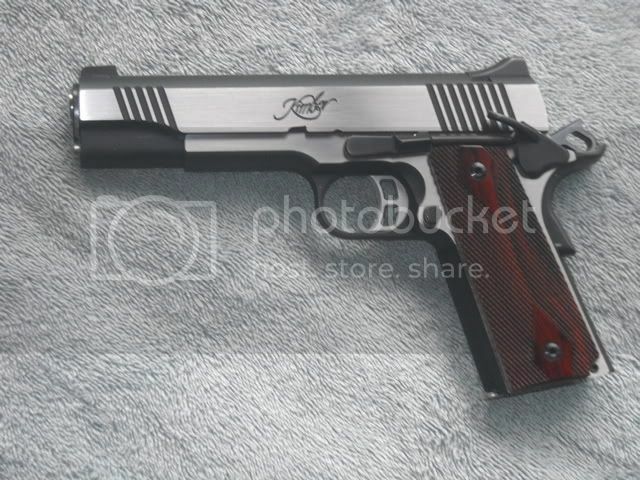 The .357 Magnum was developed in 1934, and the first weapon to chamber it was released in 1935. It was developed in response to the .38 Super (which incidentally was found to penetrate the bulletproof – bullet-resistant, thanks – vests of the day. That required a faster bullet, as those vests were proof against anything slower than 1,000 fps). Well, the .357 would eventually far, far eclipse this. More on that in a moment. Regardless, this is a very high energy cartridge, and the pressure is about double that of the .38 Special that was the foundation of the design. This led to the case being lengthened by about 3mm to prevent being able to close the cylinder on .38 Special revolvers accidentally loaded with .357M cartridges, which can be counted on to have very poor outcomes to the weapon and the shooter. 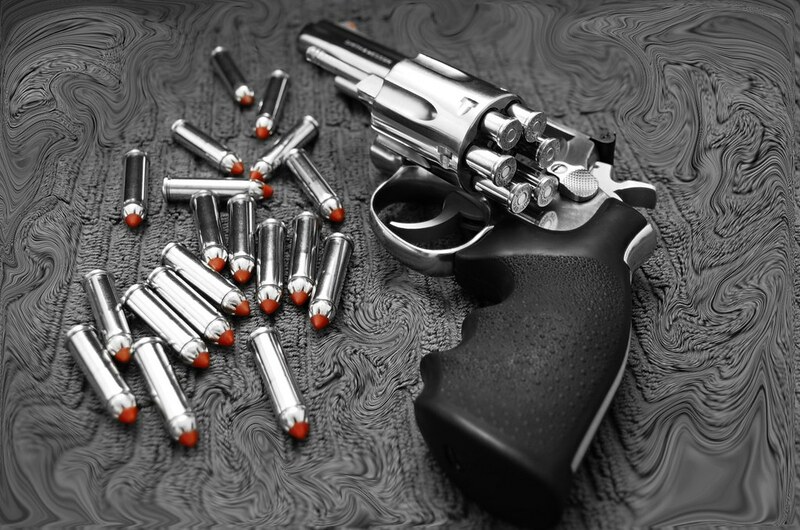 The .357 and .38 cartridges both fire 9.07mm bullets (actually .355 to .357″); the .38″ refers to a naming convention used for the outside diameter of the cartridge case. In any case, this for a long while was the standard reference cartridge by which – rightly or wrongly – all other self-defense and law enforcement cartridges were judged. You can see this in many period writings, and even the more-recent .357 SIG hearkens back to the power (and given the loading below, that is both literal and advertising power) of the .357M harnessed in a conveniently sized automatic platform. But there’s no question: the .357 is a powerhouse, and revolvers chambered in it with barrel lengths from 4″ to 8″ are bad news if you’re on the wrong end of them. The power is such that they made somewhat-attractive snub-nosed backup guns as well, though having fired one myself, for this purpose a small-frame 9mm is probably a better choice. More on that later. Basic inputs for the calculator are as follows, selecting 101.6mm (4″) for the (test) barrel length. The .357M has a lot of chamberings available for it. Everything from about 7 to 12 grams (110 to 158 gr), with the most common seeming to be 125gr and 158gr. Both are available in a wide variety of energy ranges, and some of those energies are shockingly high. The highest energy projectile found develops 1,700fps out of a 4″ barrel. 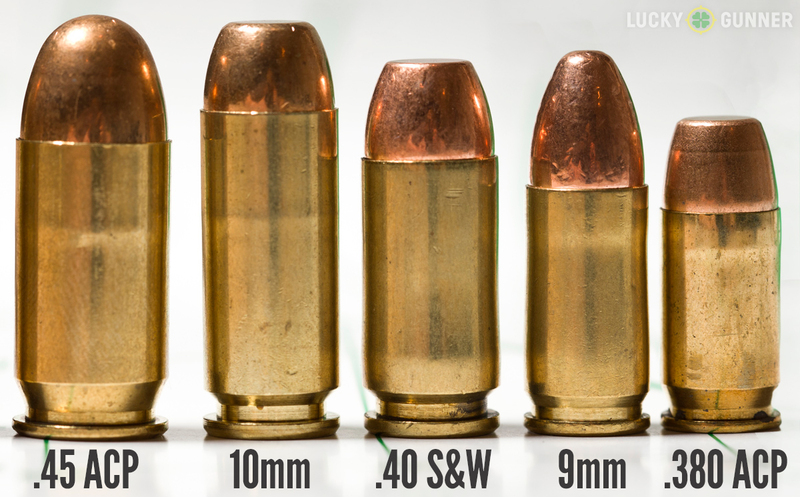 The military 9mm is 124gr and develops 1,250fps out of a 5″ barrel. So yeah, it’s a monster. As per usual, I selected the biggest and baddest load to do GURPS stats of, because players will usually gravitate towards this. The velocity is at the muzzle. The velocity with a 4″ (101.6mm) test barrel is tuned to match real-world data at 1700fps with a 124gr JHP bullet. This might not be the very highest energy .357 available, but it’s likely close. Velocity out of shorter than a 2″ barrel falls off dramatically – you can lose 1d per 2mm of barrel in this range. The bulk of a .357 cylinder would suggest perhaps going with the 9mm or similar loads actually tuned to deliver performance out of a shorter barrel. I very strongly suspect that the “tipping point” where the propellant charge no longer accelerates the bullet falls rather lower than the 6d damage shown here. 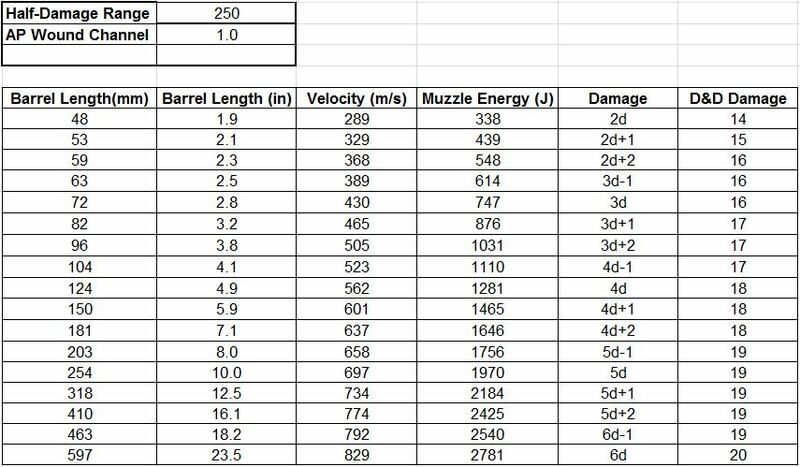 This site, “Ballistics by the inch,” shows a 125gr .357M getting the best velocity out of a 16″ barrel, falling from 2000fps down to 1740fps by adding 2″ of barrel. So cutting off damage increases past 16″ of barrel is probably legit. The very, very good results from 3″ to 16″ barrels make the .357M a versatile cartridge, especially in situations where carrying more than one type is impractical for whatever reason. The very, very good results are also a direct result of taking the highest energy I could find. A more reasonable 125gr projectile that is tuned to 1450fps from a 4″ barrel, or a 158gr hunting load at about 1250fps (9mm velocity with a heavier bullet) will both deliver about 3d damage from a 4″ barrel, a 15% reduction. The lower powder burn length required in the model will also tend to tap out the velocity at lower barrel lengths as well. The JHP with modern design is quite impressive, expanding in this case to 1.95x its starting diameter, or about 17mm – enough to legitimately earn a pi++ modifier. Damage falls to 2d+1 in the model, but 2d+1 pi++ is nothing to sneeze at, being both more penetrating and equally expanding as a .45ACP. GURPS rules don’t allow that, but the same bullet would do 3d (0.5) pi+. So my model would predict 8 points of penetration, and 16 points of injury. GURPS RAW would be 5.25 points of penetration, 15.75 points of injury for the JHP bullets, compared to a flat 10.5 points of penetration and injury for FMJ rounds. The platforms here can be summarized quickly. Sub-nosed revolvers, moderate-barrel revolvers, big-honkin’ barrel revolvers, one or two insane semi-automatic pistols, and lever action carbines. Starting with the rifle, you can expect a 16″ barrel and 8-round or 10-round capacity, and probably Acc 4 from this. It’s handy and will allow you to get the most possible velocity out of the very effective .357M. Next comes the semi-auto, which is basically either a 1911-style frame (Coonan sells one), or the venerable and oft-discussed Desert Eagle. We’ve seen the DE before, so I’ll find a picture of the Coonan.